Many machines used in automated manufacturing environments in the early 1970's had rotary cam switches or limit switches to sense machine position and used hard-wired relay control panels to control machine operation. Even the smallest change in machine control logic required extensive work to modify the relay control panel. New control development was very inefficient since each control logic required custom-built hardware. Further, adjusting a machine's cam settings for a new set-up required many hours or even days of machine down-time. The mid 70's saw the development of new controls to solve these problems. Programmable Logic Controllers (PLCs) were developed to replace the relay control panels and AVG Automation invented an electronic Programmable Limit Switch (PLS) to replace the mechanical, cam tripped, limit switches. The PLS consists of an absolute-position transducer, mounted in place of the rotary cam limit switch, and programmable electronics mounted in the control panel. With the advent of the PLS, cam settings can be altered in minutes instead of hours. Also, cam settings can be optimized by fine­tuning while a machine is in operation. The PLS and PLC combination has been so successfully employed in factory automation that it is now standard for many kinds of machines. The PLS, because of its speed and accuracy, controls high-speed machine operations with precision and can provide the PLC accurate timing, position, or RPM data. The PLC controls slower machine functions and provides overall machine control. 1.Synchronization of rapidly changing position data to the input scan of a PLC. 2.Slow scan time of a PLC. The lack of synchronization may result in misreading of the position information occasionally. AVG Automation solved synchronization problems for PLC users by inventing the PC­Handshake module in 1978. An external PC-Handshake Module, however, negated the concept of "one control box". Even though PLCs have been getting faster and faster, it is inconceivable for a PLC to be able to handle the desired position transducer data rates. For example, even a 5-ms scan time allows a top speed of only 33 rpm for V resolution. 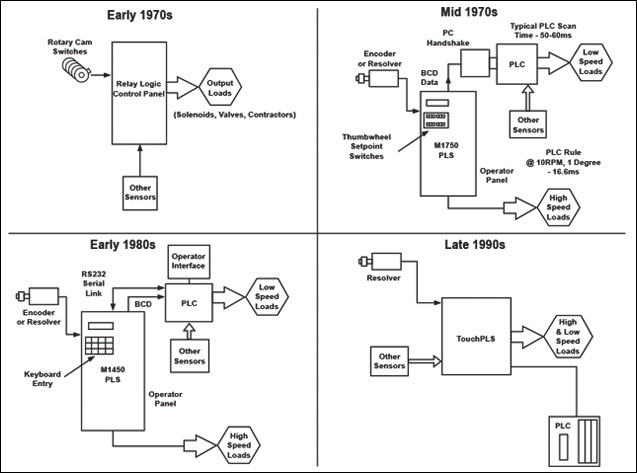 In the early 1980's the state of the art in machine control was a combination of a PLS for high-speed response and ease of set-up and a PLC for control logic and intelligent networking. A PLS system consists of a position transducer mounted on a machine's drive shaft and a programmable unit mounted in the machine control panel. In AVG Automation's case, the position transducer is a resolver, which produces analog signals proportional to the shaft position. The position signals are converted to digital format by an internal ratiometric tracking converter in the programmable unit, displayed on the front panel and compared to the dwell setpoints programmed into the PLS. When the process cycle reaches these setpoints, outputs are turned ON or OFF, to start or stop desired functions during the cycle. The cam limits or dwells arc programmed into the PLS by thumbwheel settings or simple keyboard entries right from the control panel. No more climbing to the top of the press to make cam adjustments which were not only tedious but also very time consuming. Furthermore, with the PLSs, the fine­tuning can be done on the fly. 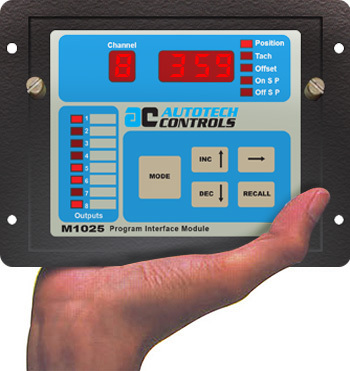 PLSs today offer many advanced features such as zero offset adjustment, dynamic zeroing and programmable rate offset. Zero offset feature allows the operation an easy way of aligning resolver zero to the machine zero. Dynamic zeroing and ModZ allows modification of the zero reference for selected channels independent of the actual resolver position. Programmable rate offset, ROF, allows automatic adjustment of set points to compensate for machine speed variations. The AVG Automation microprocessor-based PLSs uses a patented DMA technique employing look-up tables to achieve the fastest machine operation in the industry: 20,000 setpoints in 85 µs.